Warm fresh apple muffin recipes from the oven make quite an accompaniment to any meal or just for a snack. They make a quick delicious breakfast with coffee, tea or hot chocolate. They can be baked in a variety of sizes and with additional flavors to fit anyone’s taste buds. They are the all occasion food! Apple muffin recipes are generally very moist and delicious due to the addition of apples. The flavor also blends well with many other ingredients allowing for additional taste and texture. Normally being made with quick bread recipes they are quick and easy to make and to bake. Like all muffins, the apple muffin recipes should produce tender delicacies. The batter is thick rather than a dough and it should be stirred only until the mixture is just moist. Stirring the batter too much or until smooth will toughen the texture. Small lumps which are left in the batter will disappear during the baking. The heavy batter is what supports ingredients like the apples, nuts and raisins which go very well with the apples. Other ingredients which you might want to try in your apple muffin recipes are all types of fresh fruit, a variety of cheese and even some meats like finely chopped cooked bacon or finely chopped ham. Use your imagination and don’t be limited; you might develop a special recipe. Prepare large muffin pan by greasing with butter or using paper liners. In a small bowl combine the milk, butter and egg; whisk to blend. Stir the egg mixture into the dry ingredients just enough to moisten. 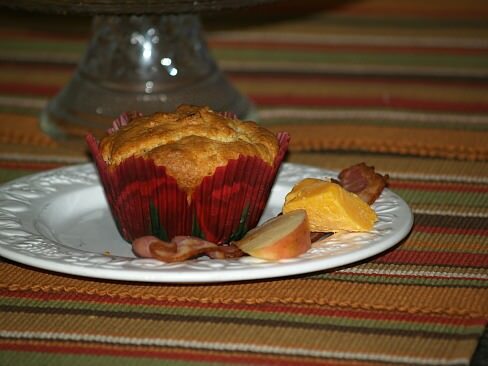 Fold in the apple, cheese and bacon.Spoon into the prepared muffin pans 1/2 full. Bake 15 to 20 minutes or until golden brown and pick comes out clean; remove from pan. Many apple recipes will call for a variety of spices in them which enhance the apple flavor. Prepare a well greased muffin pan or line it with paper muffin liners. Sift together the flour, baking powder, sugar and nutmeg. Make a well in the center and add the oil, milk, beaten egg and apple; mix only until moistened. Spoon batter into the prepared muffin pan ¾ full. Combine the following streusel topping and top each muffin with 1 teaspoonful. Bake for 20 to 25 minutes or until a pick comes out clean. 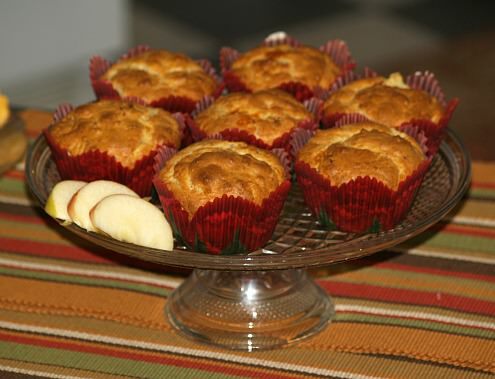 Many of the apple muffin recipes will add additional ingredients to them like pumpkin, carrots, zucchini and others. These added ingredients add to the flavor and moistness of the muffins. Combine in small bowl flour, sugar, baking powder, baking soda, cinnamon, salt and nutmeg. In large mixing bowl beat eggs, milk, oil and lemon juice; add in flour mixture, oats, apples and nuts. Stir mixture only until dry ingredients are moistened; spoon into paper lined muffin cups. Bake 20 minutes or until golden brown; spoon lemon glaze over the top. Combine ½ cup powdered sugar, 1 tablespoon lemon juice and 1 tablespoon melted butter.